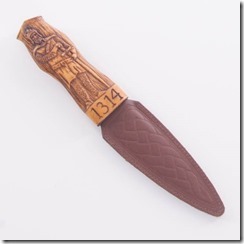 If you have ever seen someone dressed in a traditional Kilt or Highland Outfit you might have noticed, at the top of one of the wearers hose, a hilt of a small knife, this is known as the Sgian dubh. 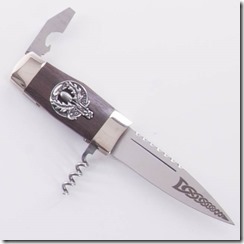 The Sgian dubh (pronounced skian doo) is a gaelic word, “Sgian” means knife or dagger or blade and "dubh" means black. 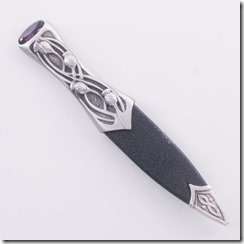 There are many stories of the Sgian dubh but the most common tale is that it was originally a dagger held under the armpit as a hidden blade. When entering a home the visitor would reveal any hidden blades as an act of trust. 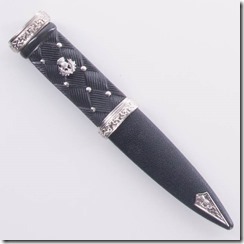 The hidden blade would then be displayed at the top of the sock or stocking for the host to see and this is where the Sgian dubh is now commonly worn today. We have a wide selection of Sgian Dubhs to choose from at The Kilt Store if you have any questions about any of our products please don’t hesitate to call us on 01316603451 and our team would be glad to help.